​Worth It Stores is always interested in real estate opportunities for future growth. Please see below for general information and some of our requirements. You may get in touch with us by clicking the “CONTACT US” tab in our website. For a list of current locations please visit “LOCATIONS” in our website. Thank you. 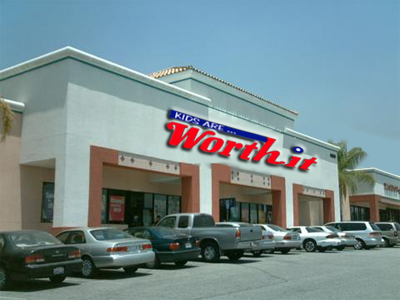 Worth It Stores is a chain of retail stores established in South Florida over 25 years. With a focus on children’s clothing from newborn to teens, related accessories, shoes and school uniforms, all at affordable prices, we also offer women’s specialty items and gifts. All of our merchandise caters to value seeking fashion conscious consumers. All at prices that enable the customers to shop our stores frequently. We oﬀer extensive, ever-changing fashions for dress or casual wear that appeal speciﬁcally to our target market. The Worth It Stores shopper is fashionable and price conscious and very value oriented. Our clients are quick to embrace fashion trends, and the value they find at Worth It enables them to shop with us frequently. Our customer base is ethnically diverse and consists of every member of a family. Grandparents, parents, aunts and uncles, as well as young people themselves shop at Worth It, where our merchandise mix makes it easy to find something for every member of the family. Worth It Stores is strategically designed to appeal to all of our customers. The consistent store layout brings a feel of familiarity…where every customer knows where to find their favorite item. The environment is well lit, filled with music and staffed with our friendly associates who can assist customers through a diverse mix of merchandise to fit any occasion. The Worth It Stores management team, who brings a wealth of experience to work every single day, takes a hands-on approach to the business. This allows us to react quickly to ever changing trends and satisfy our customers’ needs almost on a real-time basis. Our team of buyers and merchandisers scour all markets for the latest in fashion at the very best value to our customers. Many of the team’s members have been on board since the early years. Power centers, regional and community shopping centers with national tenants, deep discount anchors, dominant supermarket or discount apparel anchors. • Targeting 3,500 to 4,500 square feet with minimum 35-foot storefront. • Metropolitan/Urban customers with a flair for “Fashion Forward” merchandise. • Minimum population of 50,000 people in 3 miles. • Median household income of no more than $60,000. • We are looking to expand in our existing markets which may include those communities that are adjacent to these markets, i.e., less than 50 miles away. OPEN THE DOOR TO WORTH IT CUSTOMERS!